Water waves and sound waves are examples of mechanical waves. Light waves are not considered mechanical waves because they don't involve the motion of matter. Most of the mathematics and properties of mechanical waves apply to light waves. 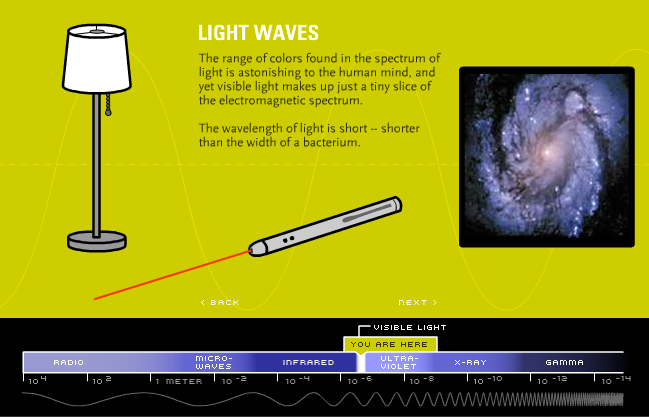 Light waves are different from mechanical waves, however, because they can travel through a vacuum. 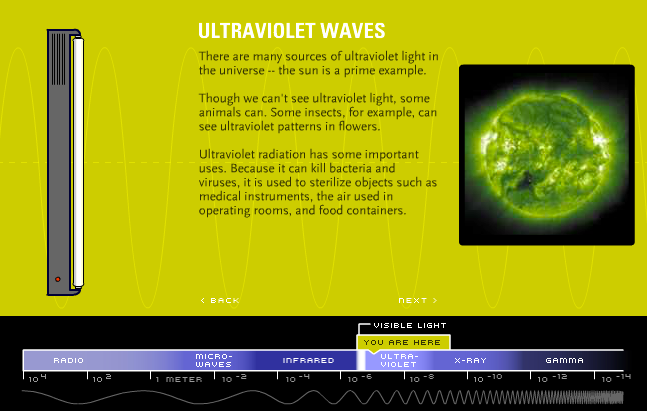 Light waves are just one type of electromagnetic wave. 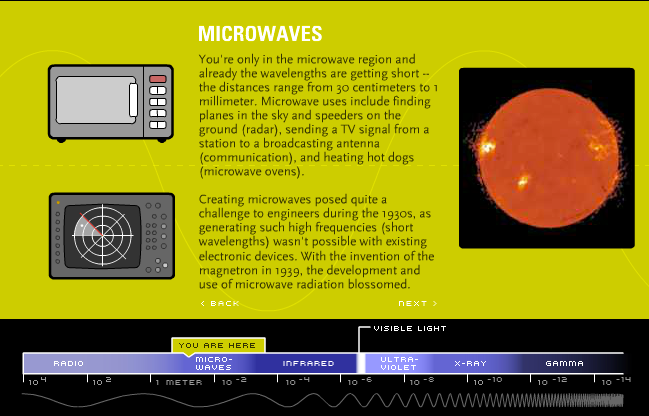 Other electromagnetic waves include the microwaves in your oven, radio waves, and X-rays. Light waves are regarded as a varying electric field (E) coupled with a varying magnetic field (B), at right angles to each other and to the direction of travel. This is depicted in the animation below. 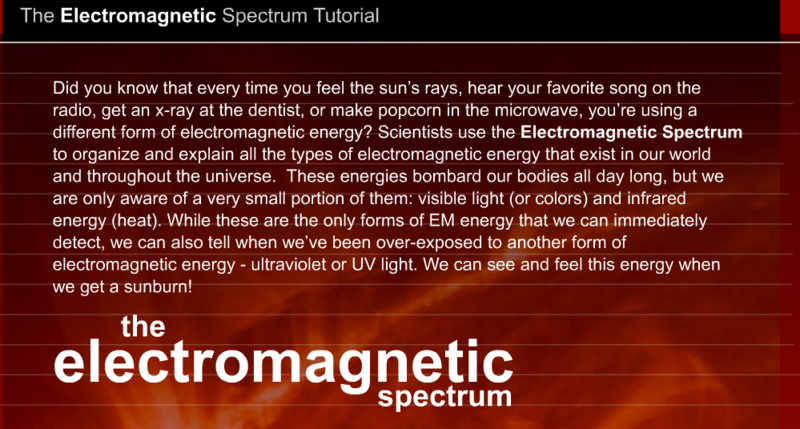 You need to know that there exists a large family of waves, each with a different wavelength range, called the electromagnetic spectrum (sometimes shortened to the e-m spectrum). These waves all travel at the speed of light (300,000,000 metres per second) in a vacuum. In addition, you need to know more about these waves - what the waves are, what they have in common, what is special about each part of the spectrum and what the waves are used for. Electromagnetic waves carry transverse vibrations in electrical and magnetic fields, not vibrating particles. Electromagnetic waves do not need matter to travel through - they can travel through empty space (a vacuum). In a vacuum, all electromagnetic waves travel at approximately 3 x 10^8 m/s - the fastest speed possible. 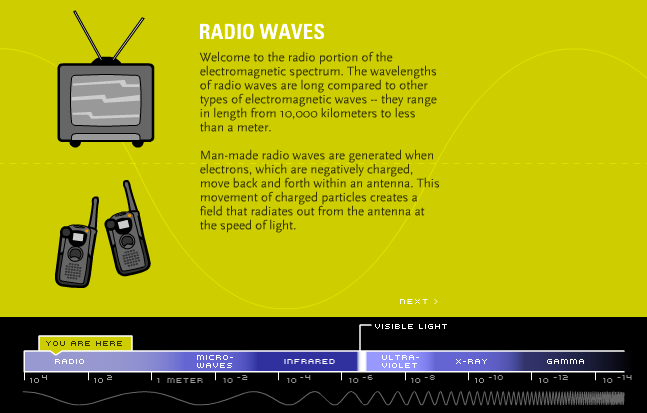 When electromagnetic waves travel through matter (for example, light through air or glass), they travel a bit slower than this but rarely less than half as fast as in a vacuum. The value for light travelling through an optical fibre, for example, is taken as 2 x 108 m/s. 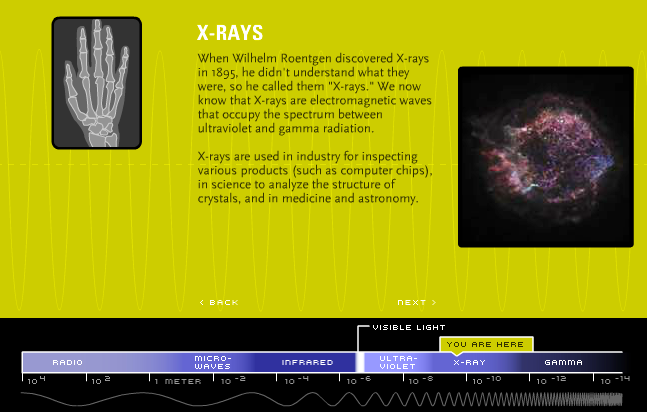 Many parts of the electromagnetic spectrum are used in medicine. You should be able to describe some of these uses. The following facts will be of help although you may have been taught other uses for some or all of the parts of the spectrum. A laser is a concentrated high-energy beam of light. A carbon dioxide laser is used to treat tumours. An argon laser is used to repair damage to the retina of the eye. An argon laser is also used to remove birthmarks. X-rays pass through soft body tissue but are absorbed by dense bones in the body. X-rays darken an unexposed photographic film. They are used to detect breaks in bones - the break showing up as a dark line on a photographic film while the bone appears white. 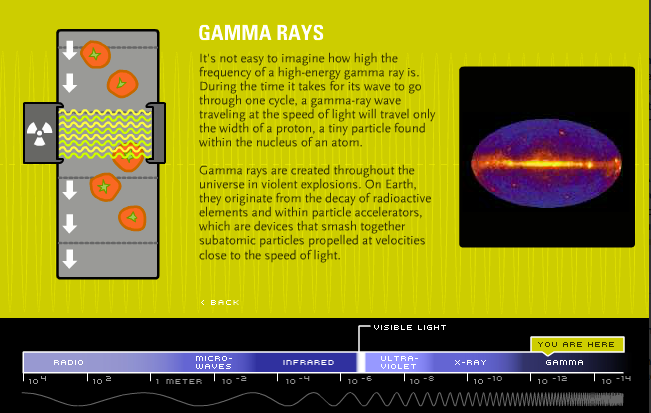 Gamma rays are produced by tracers taken into the body and detected using a gamma camera. Ultraviolet radiation is used to treat skin conditions such as acne. Ultraviolet radiation is also used to sterilise equipment because it can kill harmful bacteria. Too much exposure to ultraviolet radiation may produce skin cancer. 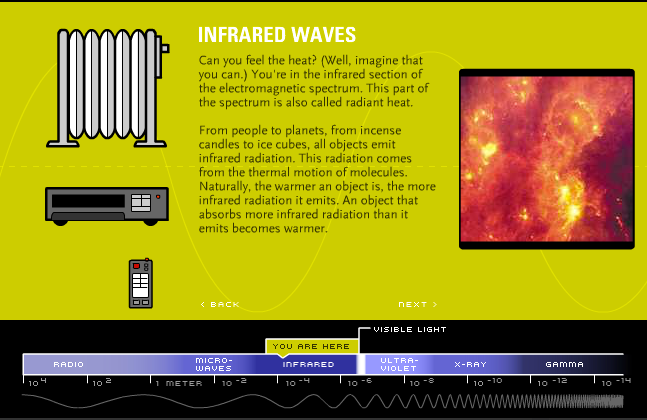 Infrared radiation is another term for heat. Infrared radiation is used to treat strained muscles and tissue. 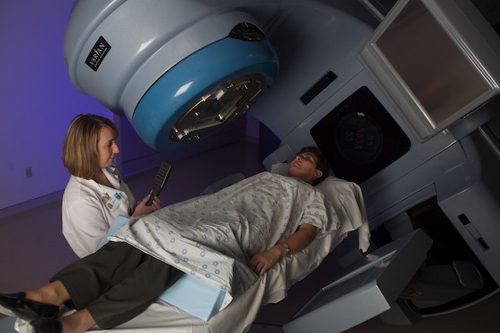 Infrared radiation is also used to diagnose tumours. This works because a tumour emits more infrared radiation than healthy tissue does. This radiation can be detected on a thermogram - a photograph taken using infrared radiation.